HOMESTEAD, FL -- You can find a lot of unique things at the flea market. A wild Burmese python isn't usually one of those things. But it's exactly what one woman found while looking through a pile of clothes at a flea market in Homestead, Florida, ABC affiliate WFTV-TV reports. 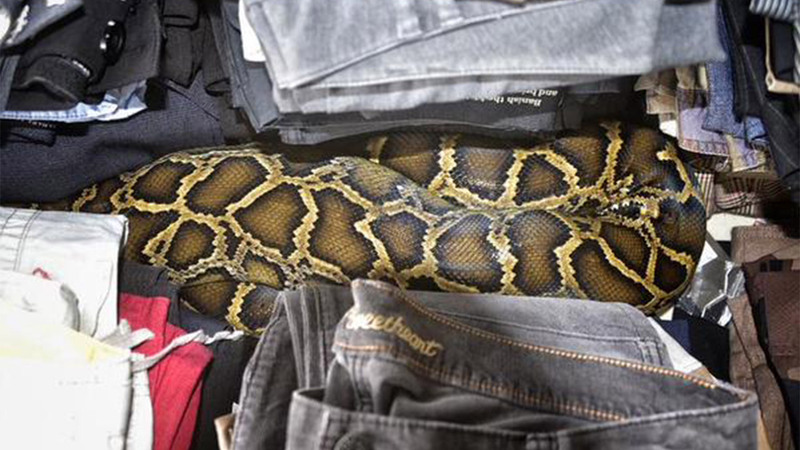 After spotting the snake, flea market officials called the fire department for help. Firefighters believe the 8-foot, 40-pound python was likely looking for a cozy place to digest a recent meal. The pile of clothes happened to be the perfect spot. "It's a good thing she didn't grab it," Miami-Dade Fire-Rescue Lt. Scott Mullen told the Miami Herald, explaining the snakes aren't venomous but do have more than 100 sharp teeth. Firefighters then safely removed the snake from the flea market. Burmese pythons are not native to Florida, meaning the snake now likely faces euthanasia.